The issue of scientific knowledge openness is urgent worldwide, but for Russia it is particularly crucial because of the inaccessibility of the most cited academic journals there. In this paper a solution for this issue is proposed by means of the gold-oriented method which assumes placing scientific papers of traditional academic journals in open access and ensuring their visibility on the Internet. This method is implemented in the project of open science repository called as CyberLeninka and discussed in details in the paper. 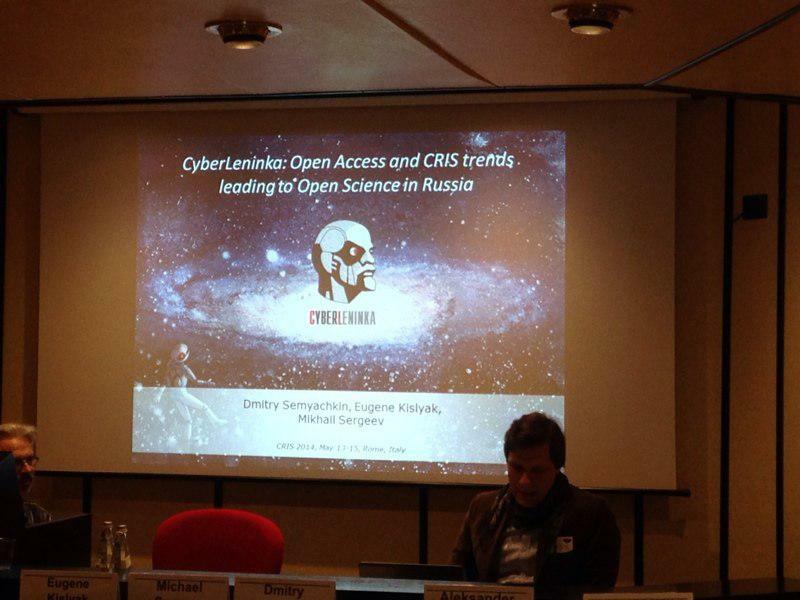 Also plans to evolve CyberLeninka to a CERIF-CRIS and vision to build the e-infrastructure of Open Science in Russia are provided. Nowadays the number of Russian scientific journals’ readers is insignificant because of journals low print runs, the difficulty to find journals’ papers on the Internet and a limited paid access to some of them. Currently this limited paid access refers to more than 180 elite and most cited academic journals for all branches of modern science published by well-known MAIK Nauka/Interperiodica in cooperation with Pleiades Publishing Inc. with the support of the Russian Academy of Sciences. Despite the fact that a lot of research is funded by government, the results remain inaccessible to most people. In other words knowledge accessibility and openness among students, researchers and everybody interested in the latest achievements of modern Russian science is the problem of current importance. According to Russian Higher Attestation Commission (HAC) resolution academic journals with permission to publish PhDs’ dissertations results must place abstracts, keywords and author information on their web sites. This data should be available on the Internet both in English and Russian languages free of charge. Full texts of papers also must be available free of charge either for all or only for subscribers, not later than one year after journal release date. every journal creates its own repository, so there are a large number of distributed small repositories which are difficult to find. We suppose that creating of several large repositories with metadata and visible content would be a solution. The Budapest Open Access (OA) Initiative proposes two ways of meeting the goal of open access. The approach of self-archiving (green road) follows the idea that the authors archive their papers on their personal and/or institutional web sites or in subject-specific repositories or archives (arXiv, PubMed, etc.). Currently this approach is not widely used in Russia and CIS: there are no large centralized repositories and just minority of authors publish their papers in this way. According to the approach of OA journals (gold road) published papers are immediately available and free of charge on their web sites. This model is mostly funded by authors themselves (usually through a research grant). But unfortunately this approach is not popular in Russia and CIS as well: the number of OA journals is insignificant and most of them are not popular among scientists. The natural evolution of the world science due to Internet impact is now at the beginning of a new stage called as “Open Science”. International scientific community is in process of refining the Open Science paradigm and developing new information technologies for this e-infrastructure. Open Science suggests solutions to the most urgent issues of modern science such as transparency increase of the research process, more accurate disclosure of the impact of individual scientists, research groups and organizations and significant increase in the efficiency of limited public resources usage for research. As far as Russia is concerned the issue of creating an Open Science infrastructure is being discussed in academic community. In this section we will present our vision of how this infrastructure can be implemented in Russia. We believe that the key factor of building such infrastructure is to place the papers of academic journals in the public domain. For this purpose it is necessary to create several open access repositories licensed by HAC where journals will have to place their papers. Following the definition of OA an access to these papers should be free, immediate, permanent, fulltext and online. HAC will license open access repositories according to these criteria. To comply with the OA definition we propose a decentralized infrastructure (Figure 1) based on CRIS-CERIF standards with HAC as a supervisory authority and with open access repository as the basic structural component (CRIS). In order to ensure permanent access it is necessary to have several open access repositories which have to be coordinated (CERIF). According to Open Science infrastructure traditional business model of journals will change as well. Today they sell printed copies and provide online access to papers. In the future they will be able to get profit by collecting publishing fee, particularly fee for allocating paper digital identifier (DOI suffix analog). 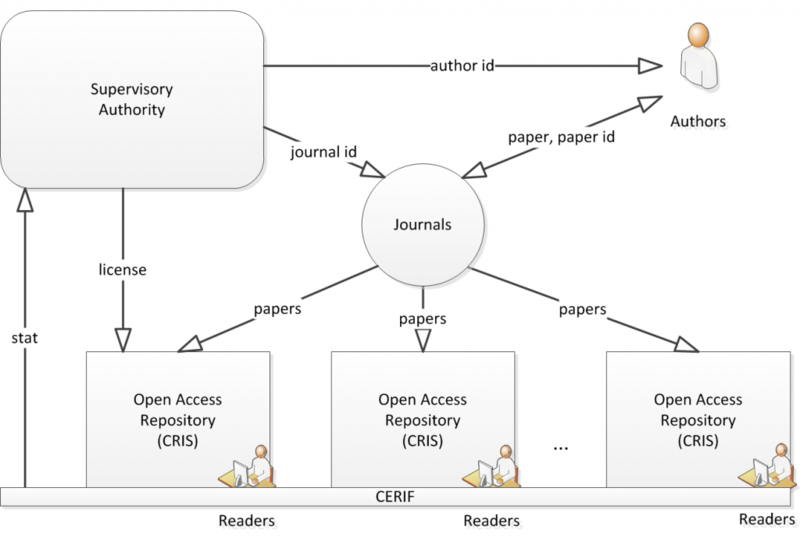 Open access repository can be created by journals or on the basis of existing scientific information systems (e.g. Socionet and CyberLeninka), also it can be commercial or non-commercial and can use various open access policy (green, gold or both). We propose gold-oriented method which assumes placing papers of traditional (non-OA) academic journals in public domain and ensuring their visibility on the Internet. The method is implemented in open access repository called as CyberLeninka. It is designed for science and research activities promotion, public control of scientific publications quality, and papers-in-Russian citation increase. Mobile oriented — access to scientific papers on popular mobile devices. We have obtained the following preliminary results. CyberLeninka has entered the list of world’s top research-oriented repositories (on 50th place) and it is the seventh in the world by visibility of materials in Google Scholar (according to Webometrics, section “Ranking Web of Repositories”). CyberLeninka contains about 350 Russian and CIS scientific journals and more than 150,000 research papers in all areas of science over the last few years. CyberLeninka’s web site is visited by more than 70,000 people per day (about 2 million unique visitors per month), that demonstrates the great interest to Russian scientific journals. CyberLeninka exports the metadata of scientific papers to the open repositories as OCLC WorldCat, Registry of Open Access Repositories (ROAR), Bielefeld Academic Search Engine (BASE), The Directory of Open Access Repositories (OpenDOAR), Research Papers in Economics (RePEc), Socionet, etc. via OAI-PMH protocol. There are more than 5,000 active users of CyberLeninka mobile applications for iOS and Android platforms. Currently CyberLeninka is a part of Russian research e-infrastructure and contains raw data about the following objects: authors, organizations, journals, papers, references, views/downloads and relationships between them. This data is enough to organize a repository of scientific papers and gather target audience, including scientists, researchers, PhD students, etc. The next step is to refine this data through interacting with authors and scientific organizations, academic publishers, universities, etc., collect additional data and bring it all to the CERIF format. Based on this data we plan to build new high-level services like citation index, authors and papers rating, self-publishing plagiarism checking service, geo mapping of journals, institutions, organizations and authors (so called “Map of Science”). Furthermore we can provide special features for scientists to connect, collaborate and work together. Also in collaboration with Socionet we will try to implement the semantic linkage technique based on CERIF data model to specify the relations between scientific entities (person, organization, paper etc.). All above-mentioned services and features might become the means of CyberLeninka transformation towards CRIS system. 1. MAIK Nauka/Interperiodica. Available from: URL: http://www.maik.ru/. 2. Higher Attestation Commission decree. Available from: URL: http://vak.ed.gov.ru/ru/help_desk/list/. 3. Budapest Open Access Initiative. Available from: URL: http://www.budapestopenaccessinitiative.org/. 4. arXiv. Available from: URL: http://arxiv.org/. 5. PubMed. Available from: URL: http://www.ncbi.nlm.nih.gov/pubmed. 6. Parinov S. The electronic library: using technology to measure and support Open Science. Proceedings of the World Library and Information Congress: 76th IFLA General Conference and Assembly, Gothenburg, Sweden. 2010. 7. Suber P. A very brief introduction to open access. 2006. 8. Asserson A., Jeffery K., Lopatenko A. CERIF: past, present and future: an overview. Proceedings of the 6th International Conference on Current Research Information Systems, University of Kassel. 2002. p. 33-40. 9. Haak, Laurel L., et al. ORCID: a system to uniquely identify researchers. Learned Publishing. 2012; 25(4). 10. Digital Object Identifier (DOI). Available from: URL: http://www.doi.org/. 11. Socionet. Available from: URL: http://socionet.ru/. 12. CyberLeninka. Available from: URL: http://cyberleninka.ru/. 13. Semyachkin D., Sergeev M, Kislyak E. Scientific digital libraries: actual problems and modern ways of their solution. Scientific journals: problems and solutions. 2013;2:20-29. 14. Creative Commons. Available from: URL: https://creativecommons.org/. 15. Webometrics: Ranking of Web Repositories. Available from: URL: http://repositories.webometrics.info/en/top_portals. 16. OCLC WorldCat. Available from: URL: http://www.worldcat.org/. 17. Registry of Open Access Repositories. Available from: URL: http://roar.eprints.org/. 18. Bielefeld Academic Search Engine. Available from: URL: http://www.base-search.net/. 19. The Directory of Open Access Repositories. Available from: URL: http://www.opendoar.org/. 20. Research Papers in Economics. Available from: URL: http://ideas.repec.org/i/a.html. 21. CyberLeninka iOS mobile app. Available from: URL: https://itunes.apple.com/ru/app/cyberleninka/id581467934. 22. CyberLeninka Android mobile app. Available from: URL: https://play.google.com/store/apps/details?id=com.rolay.cyberleninka.